The alarm went off at 3:41 a.m. this morning, the start of a three day weekend. I’ve been a bit worn out and my stomach has bothered me a couple of days this week but I nevertheless crawled out of bed, if a bit reluctantly, as high clouds were predicted instead of the usual clear skies and I was curious to see what the sunrise might bring. I was on the trails before the sun but it looked like there wouldn’t be much color in the skies as the sun rose, and there wasn’t, save for one small portion of the sky. Unable to get the picture I hoped for I instead took my delight in the serenity of the desert morning. Heading up the Vaquero Trail to where I had seen antelope squirrels the week before I stopped when I saw an American kestrel perched on a saguaro in the distance, one leg held in the air, silhouetted against the patch of orange sky. The little falcon didn’t stay long nor did the color but I got my sunrise picture after all, just not the one I was expecting, the first of several surprises the desert had in store for me this morning. The little appendages sticking out from the saguaro are spent flowers on top of the fruits developing below, handy perches above the cactus spines. 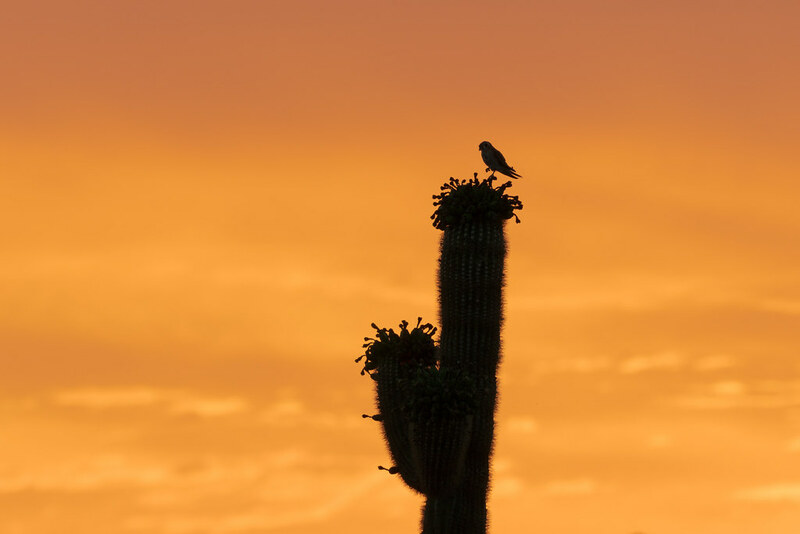 This entry was posted in Birds and tagged American kestrel, Arizona, Brown's Ranch, cactus, desert, McDowell Sonoran Preserve, perching, saguaro, Scottsdale, Sonoran Desert, sunrise, Vaquero Trail. Bookmark the permalink.